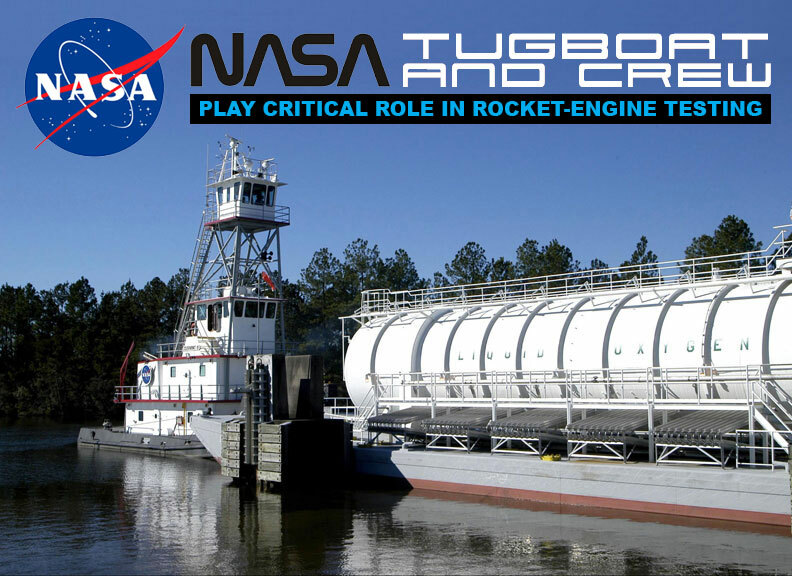 Most people probably don’t think about tugboats and barges when they experience the shake, rattle, and roar of a Space Shuttle Main Engine test at NASA’s Stennis Space Center. But behind the scenes, Captain Rodrick “Rocky” Pullman and the crew of the NASA tugboat Clermont II play a critical role. Without them, there’s no engine test — because without them, there’s no fuel. 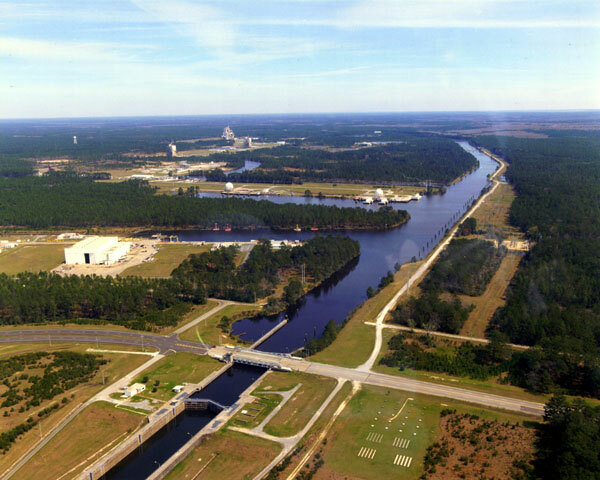 canal system at NASA’s Stennis Space Center in South Mississippi prior to a Space Shuttle Main Engine test. and 49,000 gallons of liquid oxygen. 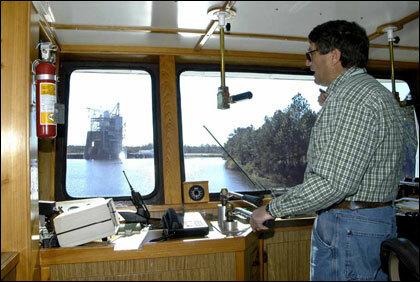 Before each test, Captain Pullman, Tugboat Pilot Grover “Shu-Shu” Bennett, Marine Maintenance Technician Dwight Strahan, and a general helper are responsible for navigating the barges of super-cool liquid hydrogen and liquid oxygen through the 7-1⁄2 mile, 16-foot-deep canal system at Stennis Space Center. Connected to the Pearl River, the canals are kept at a constant level by a lock system, spillway, and replenishment pumps. The barges are moored to docks at the test stands, then the fuel is pumped from the barges into run tanks mounted on the stands. And we’re talking about a lot of fuel. Each time a Space Shuttle Main Engine is test-fired for the 8-1⁄2 minutes it takes to propel the Space Shuttle from liftoff to low-Earth orbit, it consumes 132,000 gallons of liquid hydrogen and 49,000 gallons of liquid oxygen. — without a major accident or lost barge. In addition, the tugboat and its crew provide fuel for the certification of the RS-68 engines that power the Delta IV rockets to space. Stennis Space Center tests and proves flight-worthy every Space Shuttle Main Engine as part of NASA’s plan to safely return the Space Shuttle to flight following the loss of Space Shuttle Columbia in 2003. That plan plays a key role in NASA’s Vision for Space Exploration, which includes completing the International Space Station and then returning to the Moon, and forging on to Mars and worlds beyond. Since Pullman was hired as captain in February 1979, he and the crew of the Clermont II have made more than 7,000 fuel barge moves, about 900 of those offsite—usually to New Orleans, almost five hours one way. They’ve also made more than 1,000 work-barge moves and nearly 200 weather-buoy moves. That’s a total of almost 8,500 barge moves—without a major accident or loss of a barge. shows the direction of the view in the photo at the left. About the only thing that prevents the Clermont II from pushing a barge when it’s supposed to is a matter of safety: When the wind blows in excess of 30 m.p.h., it doesn’t move. If the tug is under way and the wind picks up, Pullman immediately steers for safe harbor. “When the wind’s blowing and the tank on the barge is full, you have to be at the top of your game to safely maneuver the vessel,” Pullman said. Fog can be a challenge, too, but that’s why there’s radar on top of the upper pilot house, the tallest point of the boat. “We’ve left Air Products (a fuel supplier near NASA’s Michoud Assembly Facility in New Orleans) and not seen the barge until we get back to Stennis,” Pullman said. The barges—attached to the bow of the 65-foot-long tug with steel cables—are no lightweights. Each weighs 700–800 tons fully loaded, and are almost constantly being refilled, depending on the Space Shuttle Main Engine testing schedule. That schedule can require more than 100 total truckloads of fuel a week and as many as seven barge moves in a day. the largest of three test stands used for Space Shuttle Main Engine testing. One liquid oxygen barge holds about 100,000 gallons, or 18–20 truckloads, and one liquid hydrogen barge holds about 270,000 gallons, or about 15 truckloads. 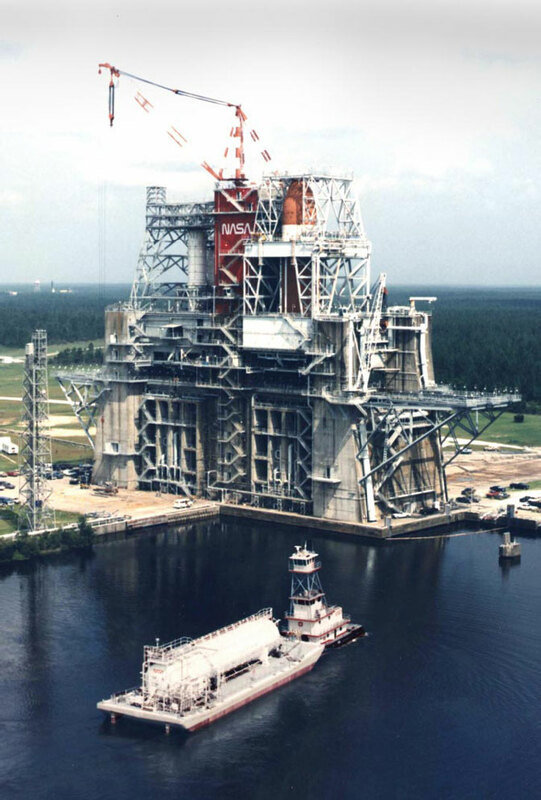 The nine technicians and supervisor of the Cryogenic Propellant Storage Facility at Stennis Space Center make sure the fuels are safely transferred to the barges, and from the barges to the test stands. Liquid oxygen is transferred directly from the trucks to the barges, but the liquid hydrogen goes from the trucks to a 600,000- gallon storage sphere, then to the barges. Pullman, Bennett, and Strahan, who all work in the Marine Department of Mississippi Space Services’ test support group, usually “borrow” a general helper from another crew. On any given barge-move day, the crew’s fourth hand could be Michael Haralson from the test composite crew, Ike Stewart from the component shop, Ross Spence from the vehicle equipment maintenance shop or heavy equipment operator Clifford Stockstill. 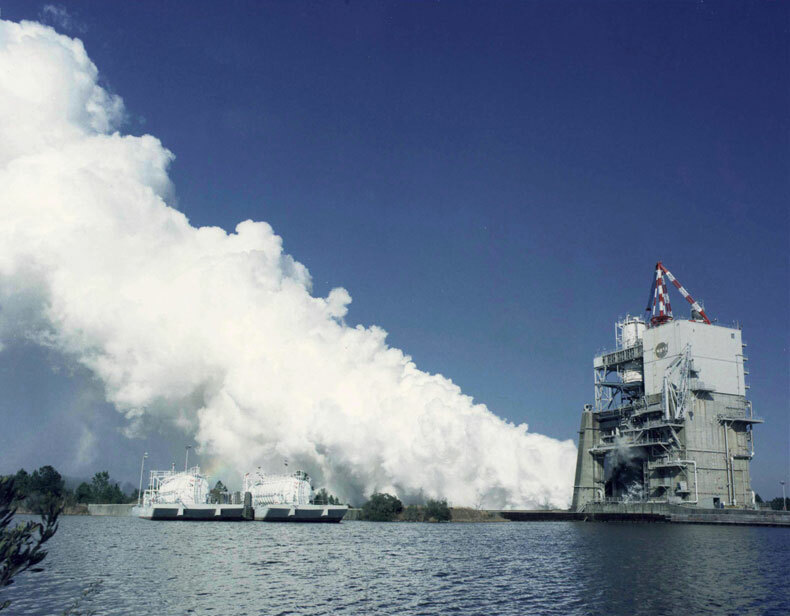 a test firing of a Space Shuttle Main Engine (left). Two barges can be seen moored at the left. To be a member of the Clermont II crew it takes, among other things, enough mechanical aptitude to maintain a 620-horsepower diesel engine, constant safety awareness, and the willingness to work in the worst kinds of weather. That work can include operating the canal locks and bridge, the lock gates, and canal replenishment pumps. The engine room needs constant maintenance, as does equipment like cables and winches. In 2011, after 30 years of carrying astronauts and satellites to and from low-Earth orbit, as well as launching and servicing the Hubble Telescope and playing a major role in the construction of the International Space Station, NASA's Shuttle Fleet was retired from service. were pushed up the Pearl River to the national rocket testing facility for extensive captive firings. 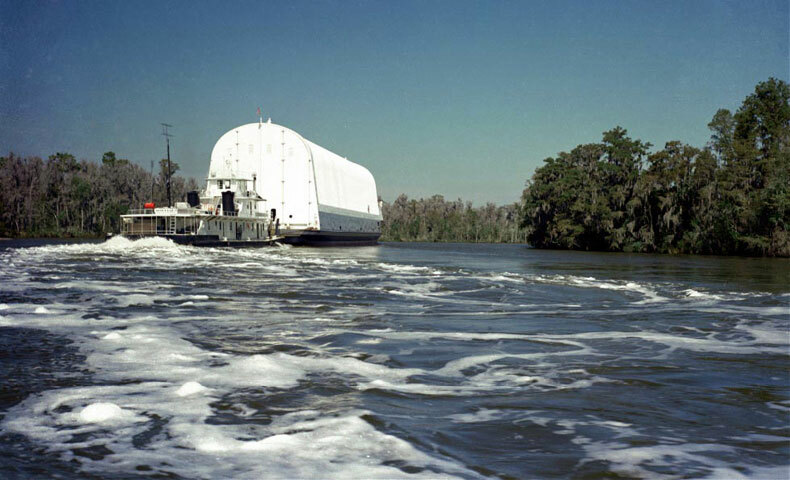 To explore more images of NASA's boats and barges, visit this NASA site .